I had an amazing 2 week trip to South Africa and scored almost 280 new species of birds as well as fantastic mammals and a few reptiles. My guide Casper Badenhorst was outstanding. You can see his web site here. 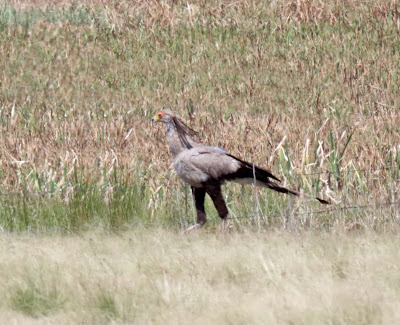 He can be contacted through the web site or if you want his email it is info@birdingandwildlifesafaris.com. I recommend him highly as he showed me so many rare birds and animals. I will use him again when I go to Southern Africa. 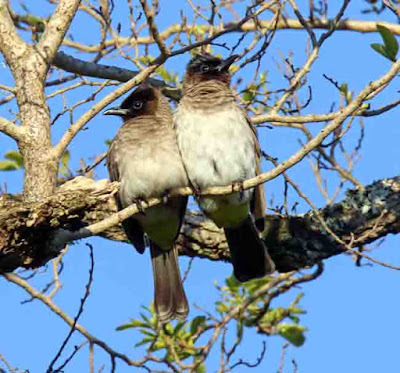 Bulbuls are a large family of medium sized songbirds in Africa and Asia. I first encountered them in China last March where I photographed 7 species. I found another 4 new ones on this trip. 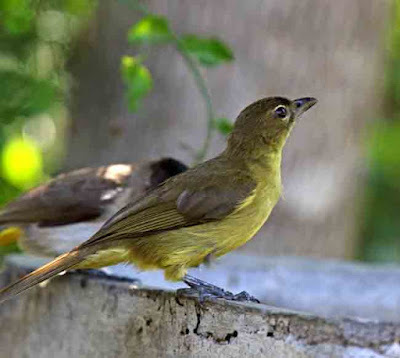 The 8" Dark-capped Bulbul (Pycnonotus tricolor) is a brown bird with light underside and dark brown face, The vent is yellow. Sexes are similar. I thought this was a cute photo with the pair sitting side-by-side. 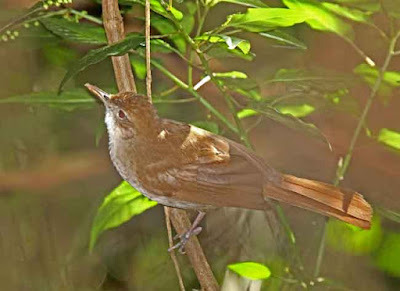 The 8" Terrestrial Brownbul (Phyllastrephus terrestris) ha a reddish brown back, a white throat and red eye. 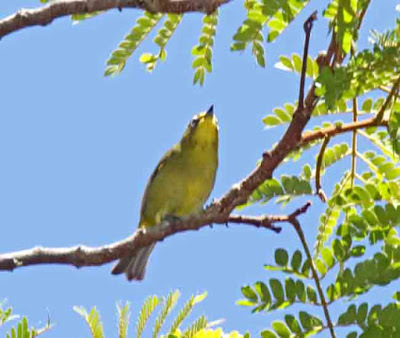 The 9" Yellow-bellied Greenbul (Chlorocichla flaviventris) had an olive back, yellowish underside and white eye arcs. 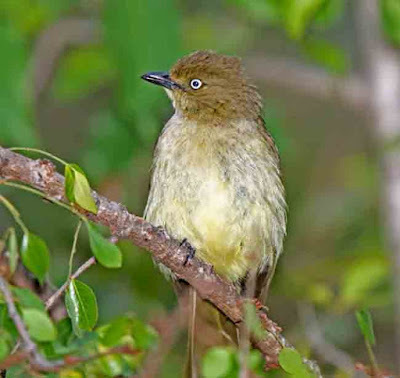 The 7.5" Sombre Greenbul (Andropadus importunus) is olive above, pale below and he has a white eye. Babblers are songbirds in several different families. 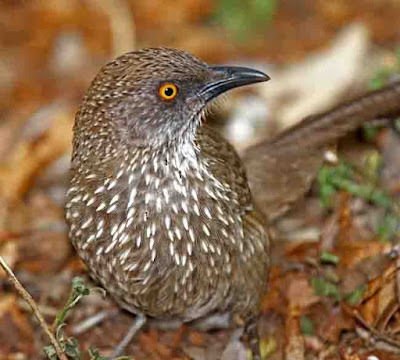 The 9" Arrow-marked Babbler (Turdoides jardineii) is in the laughingthrush family. They forage on the ground in leaf litter. 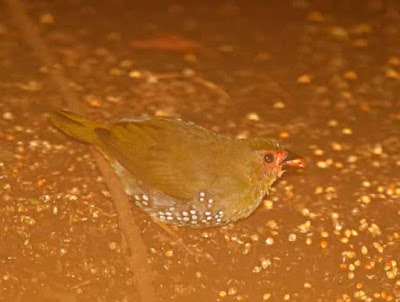 it is a gray-brown bird with spotted breast and yellow eye. The 4" Cape White-eye (Zosterops capensis) is of course in the white-eye family. It is olive above with a yellow throat and bright white eye ring. The estrildid finch family is a large (141 species) family of small colorful songbirds, many of which are used in the pet trade. All the rest of the birds in this bulletin are in this family. The 5" male Green-winged Pytilia (Pytilia melba) is olive above and on the breast, with a gray and red head, and black streaked underside. Twinspots all have black undersides with white pots. 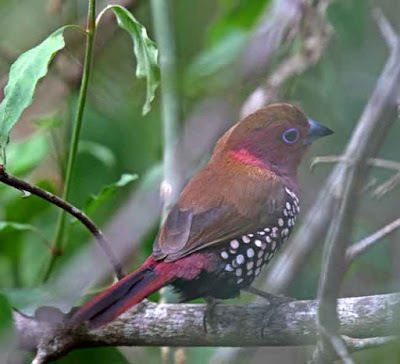 The 4" male Green Twinspot (Mandingoa nitidula) has an olive back and red face. 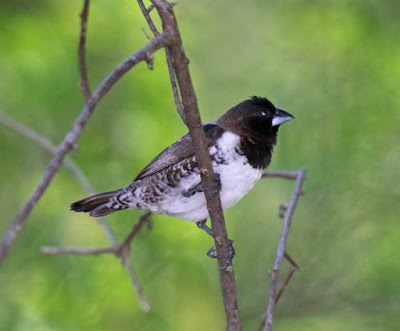 The 4.5" male Pink-throated Twinspot (Hypargos margaritatus) has a brown back and pink face and breast. He also has a bright blue eye ring. 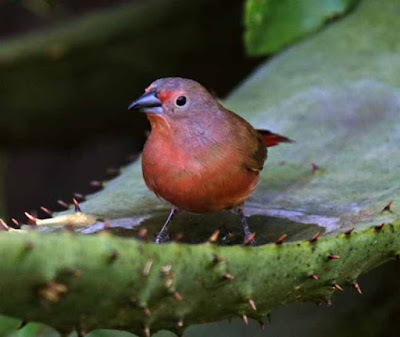 Firefinches are all reddish. 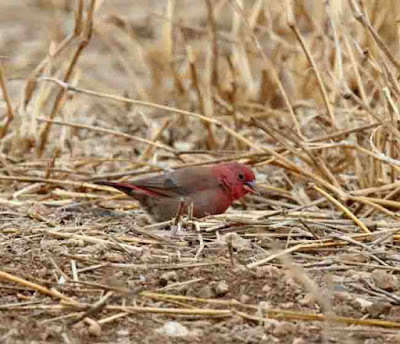 The 4" male African Firefinch (Lagonostcita rubricata) has a brown back, red underparts and pink face with a bluish bill. 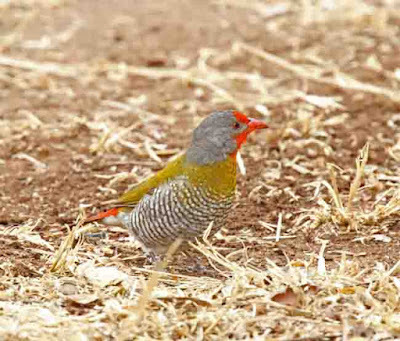 The 4" male Red-billed Firefinch (Lagonosticta senegala) has a brown back, red bill and red face and breast. 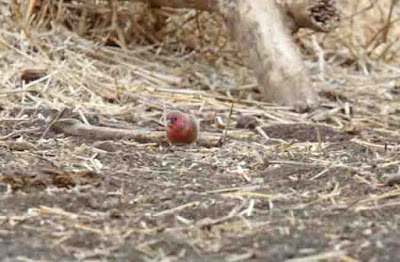 The 4" male Jameson's Firefinch (Lagonosticta rhodopareia) is brown above and has a pink face and breast. Waxbills are popular cage birds and I photographed 3 species. The sexes are the same color. 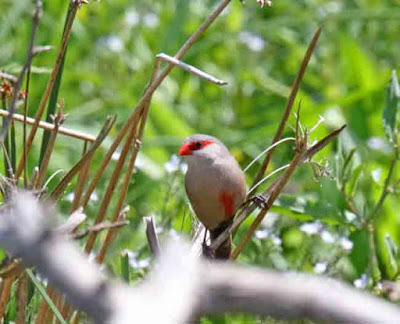 The 4" Common Waxbill (Estrilda astrild) is brown and gray with a red bill and red eye stripe. 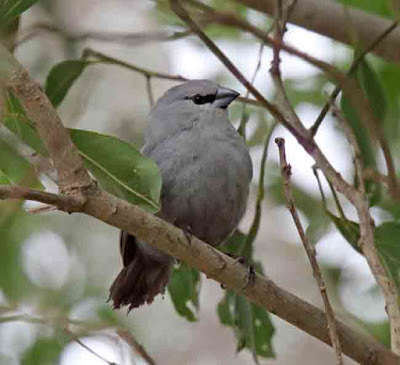 The 4" Gray Waxbill (Estrilda perreini) is all gray with a red rump and black eye stripe. 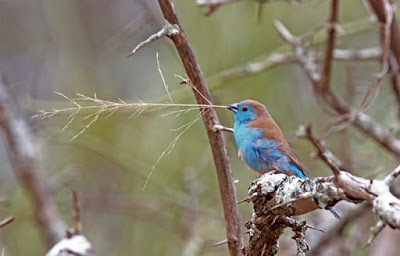 The 4.5" Blue Waxbill (Uraeginthus angolensis) is brown above with an aqua face and underparts. Here is one with nesting material. It is a beautiful little bird. 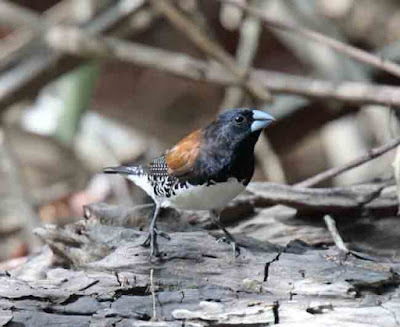 The 3.5" Bronze Mannikin (Lonchura cucullata) has a brown back, black head and pale undersie. There are a few remaining mammals that I have not described yet. 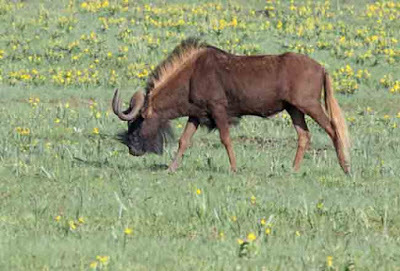 The Black Wildebeest (Connochaetes gnou) appear dark brown to black with a black face and short curved horns. The males can weigh up to 450 pounds. 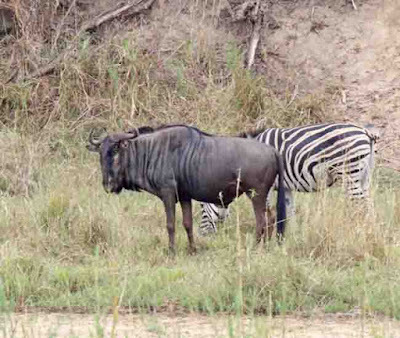 The Blue Wildebeest (Connochaetes taurinus) is dark gray with black straking on the shoulders and neck. The males can weigh up to 550 pounds. 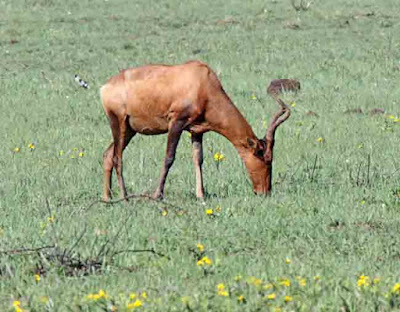 The Red Hartebeest (Alcelaphus buselaphus) is reddish brown with distinctive horns that curve upwards and then sharply posteriorly. The males can weigh up to 330 pounds. 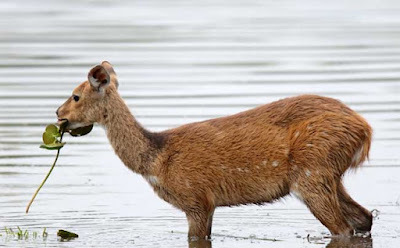 The Bushbuck (Tragelaphus scriptus) is a medium sized reddish-brown antelope with white spots on the flanks and thighs. The males can weigh up to 110 pounds I did not photograph a male. This female went into the edge of a lake to eat the water lilies. The lake was full of crocodiles and I was expecting to see her grabbed and eaten. Fortunately, she finished her meal and went back to shore unharmed. One of the sights in Africa is the Dung Beetle. 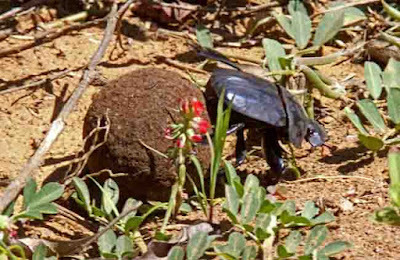 These beetles make balls for the manure of the large mammals and roll it to a chosen spot,. They bury the dung ball and lay their eggs in it. Here is a beetle pushing his ball along. They use their back legs. 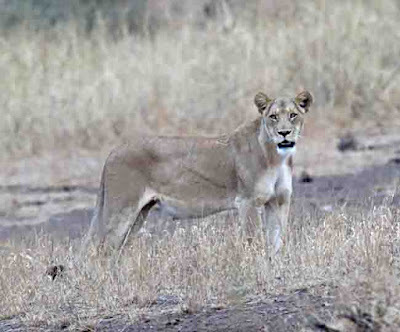 Finally, the last Africa photo, the king of beasts. 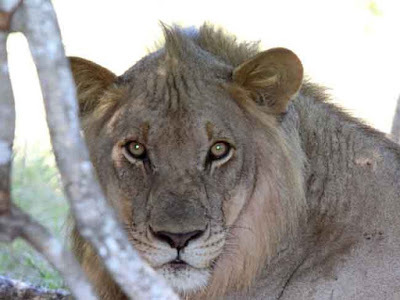 The Lion (Panthera leo) is the second largest of the cats. I learned that lions are very lazy animals as they only have to hunt every 4 or 5 days, so they spend most of the time sleeping and chilling out. The male has a mane as you know. This is one of the few photos of a lion actually standing . 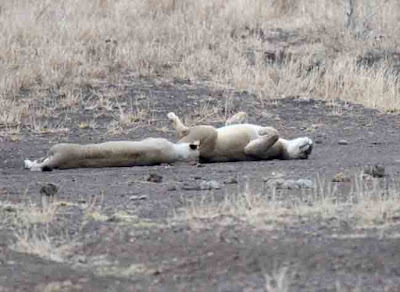 Mostly we saw them lying down or like this pair sleeping. Thanks again to my guide Casper Badenhorst for an amazing 16 day trip around eastern South Africa. To have these trip reports sent to your email, please email me at the above address and ask to subscribe. 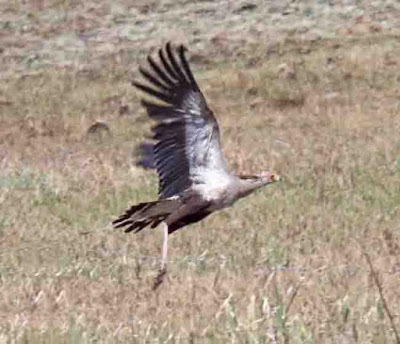 The 55" Secretarybird (Sagittarius serpentarius) is a unique long-legged raptor in its own family. 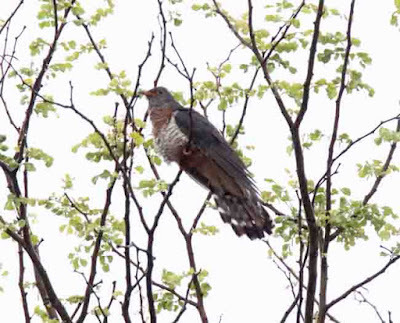 It has long plumes on the back of the head and very long tail feathers. The Old Word vultures are included in the same family as hawks and eagles, unlike the New World vultures which are a separate family. I saw 6 species for the trip. 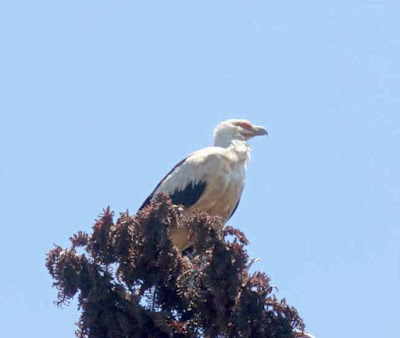 The smallest is the 24" Palm-nut Vulture (Gypohierax angolensis). It is always associated with raphia palms as about 2/3 of its diet is the nuts of this tree. It is very rare in South Africa because that tree is not native there, but has been planted. The birds have followed. This was another stroke of luck to see this bird. The guides 17 year old son, who is also a birder, has never seen this species. Here he is on top of that palm tree. The next larger is the 30" Hooded Vulture (Necrosyrtes monachus) It is a brown vulture with a white face, that turns red when excited. 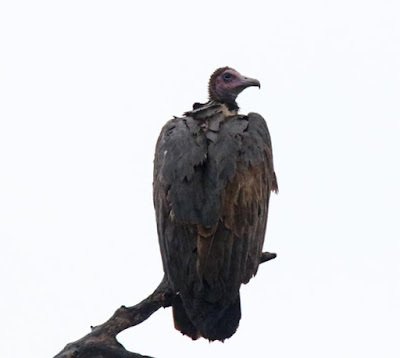 The 38" White-headed Vulture (Trigonoceps occipitalis) is black above, white below and a white head. This one has his crop full after gorging on a carcass, we will see later. 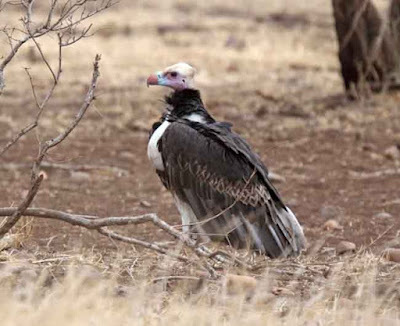 The next larger is the 40" White-backed Vulture (Gyps africanus). It is beige or brown backed with a gray neck and black face and bill. 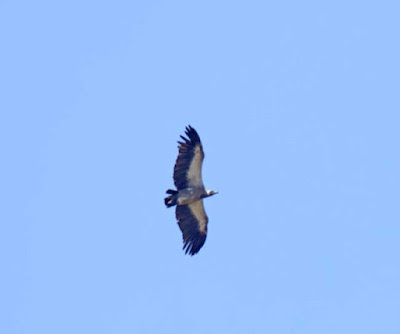 The 46" Cape Vulture (Gyps coprotheres) is a huge white headed vulture that I only saw overhead. 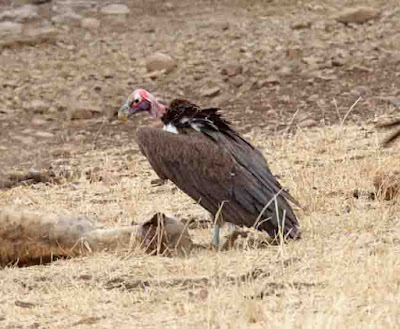 The 46" Lappet-faced Vulture (Torgos tracheliotus) is a huge brown vulture with a pink head. 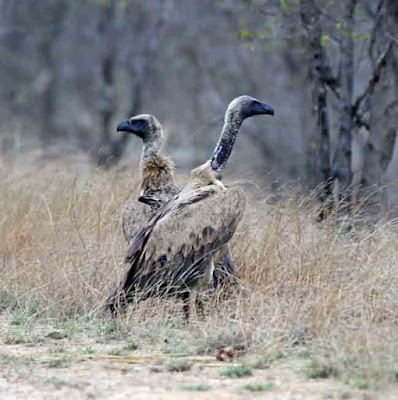 Because of its size, it is able to tear open some larger carcasses when the smaller vultures cannot. The locals call it the 'can opener'. 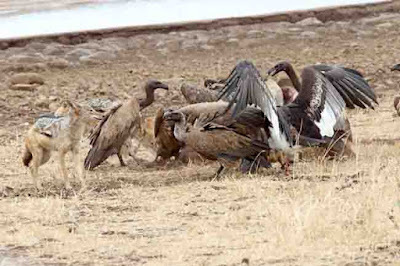 I am sure everyone has seen nature shows of vultures fighting over a carcass. We saw this spectacle once. 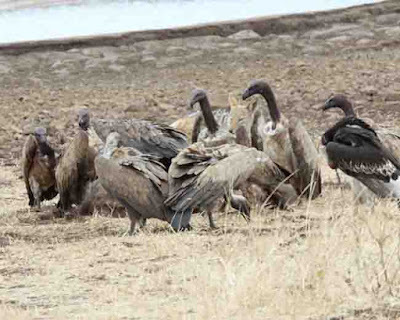 Here is a dead hyena and the vultures are swarming around trying to get at it. And in this one, some jackals are trying to get in as well. Most cuckoos in the Old World are parasitic which means they lay their eggs in other birds nests (like our cowbirds here in Americas). The 12" Red-chested Cuckoo (Cuculus solitarius) has a gray head and back and a brick red chest. 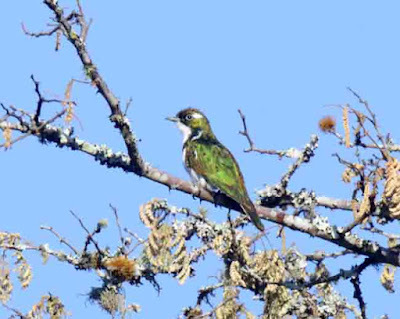 The 7" male Klaas's Cuckoo (Chrysococcyx klaas) is bright green above and white below. 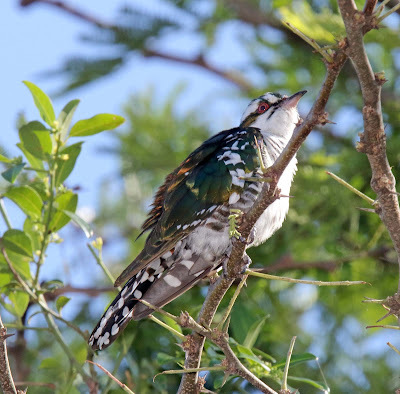 The 8" male Diederik Cuckoo (Chrysococcyx caprius) is dark green on the back and wings with white spots on the wings and tail. It is snow white below and has a red eye. 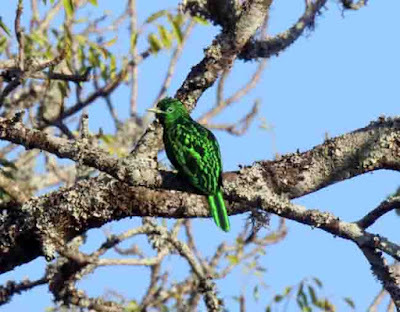 But the most beautiful is the 8" male African Emerald Cuckoo (Chrysococcyx cupreus) It is glossy green with a bright yellow breast and belly.